One of the greatest figures in Britain towards the end of the Roman Empire was General Magnus Clemens Maximus. He was born on the Iberian Peninsula in the mid-fourth century, to a Roman household with some standing, although the details of these origins are a little confused. He certainly appears to have been a relative of the Comes Theodosius, whose son was the future Emperor Theodosius the Great, but later Welsh writers either included more detail from sources now unavailable, or wove a typically Celtic heroic thread through his story. The popular life of Magnus Maximus (known as Macsen Wledig in Welsh, Prince Macsen, or Imperator) says he was the son of a Romano-Briton named Lolelinus (Welsh Llywelyn), who had travelled to Rome to take up a seat as an Imperial Senator. The legendary Coel Godhebog "the Magnificent", was Lord of Colchester, and his daughter St Helen supposedly married Emperor Constantius Chlorus. So Coel Godhebog became the uncle of Maximus, and Emperor Constantius Chlorus became the husband of his cousin, Helena. However, the chronology for this doesn't fit together. 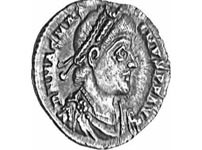 Writing up to circa 1136, Geoffrey of Monmouth stated in The History of the Kings of Britain that Maximus was of Imperial descent, and other sources show Constantius to have been his ancestor. 242 - 306 Emperor Constantius I Chlorus m. Helena Britannica ferch Coel Godhebog, High King of Britain. 274 - 337 Emperor Constantine I the Great m Fausta, daughter of Roman Emperor Maximianus I.
fl c322 Maximianus Constans Younger son. born c340 - 388 Magnus Clemens Maximus Son. Macsen Wledig of Welsh tradition. First marriage of Magnus Maximus to Ceindrech ferch Reiden. born c358 Owain Finddu (Black Lips) / Eugenius King of Mid-South Wales (later known as Cernyw). Second marriage of Magnus Maximus to St Elen Lwyddog (St Helena of the Host). born c355 Antoninus Donatus/Anwn Dynod ap Macsen King of South Wales (later known as Annan Dyfed). born c361 Constantine / Custennin Fawr (the Great) King of North Wales. born c367 Gratianna ferch Macsen m Tudwal ap Gwrfawr of Dumnonia, born c375. m Vortigern Gwrtheneu of the Pagenses & High King, born c370 - died c459. The proclamation by the Roman army in Britain of Magnus Maximus as emperor was not without precedent. In circa 286, Britain had been at the heart of an imperial crisis. An admiral named Marcus Aurelius Carausius, equipped with a fleet to drive off Saxon pirates, had set himself up as ruler of Britain and declared his independence. The Emperor Constantius at last recaptured Britain, and remained in the country for some time, rebuilding the economy and constructing a chain of forts on the east coast, the Saxon Shore. When he died at York in 306, his son, the greater Constantine, was proclaimed emperor by the army of Britain. He overthrew all his rivals, made Christianity the state religion, and gave the Empire a peace marked in London by coins imprinted Beata Tranquillitas. Maximus' revolt was seen in pretty much the same light, albeit more of a revolt against degraded authority and government corruption, and seems to have been well supported from within the island. Although Magnus Maximus was a Roman general and of high rank, he appears to have left (or charged) much of the organisation and protection of the north to Coel Hen, whose territory came to be known as the Kingdom of Northern Britain, based at Eboracum (York). He was effectively High King of Britain after Maximus, and left his kingdom to his descendants to rule for the following century and a half. Maximus concentrated his own efforts very much on the south and west of Britannia, strengthening the coastal defences to prevent incursions by Irish raiders. It seems he initially divided Wales between two of his sons. Antoninus Donatus was to govern South Wales, while Constantine protected North Wales. While the former's descendants continued his role on the south, it seems Constantine may not have lasted very long in the north, as Maximus is also credited with inviting the Manau Guotodin chief (or sub-king) Cunedda Wledig to settle his clan in north west Wales. Perhaps initially they operated under Constantine's authority. Eventually they founded the kingdom of Gwynedd, while at the same time the Irish Deisi, practically homeless after a major feud in Ireland, were settled in south west Wales, where they inherited Antoninus' Demetia territory, the successful kingdom of Dyfed. Thus, with Coel Hen in the North, and all of Wales shored against attack, the western coast of Britain was as strong as its eastern coast with its line of Saxon Shore defences. This became such a successful policy, that the raids on Britain dried up and the Irish Dalriata, instead of trying to grab British land, went north beyond the Wall to carve out a successful kingdom on the western edge of Pictland, which eventually became Scotland. Magnus Maximus left Britain in AD 383 to pursue his own claim of emperor of Rome, taking with him all the troops freed up by his reorganisations, and apparently leaving the island in a fairly good defensive position, despite the loss of good, Roman-trained troops, who never returned to Britain.